I finally finished my fall wreath that I have been planning to do for weeks now. I bought a roll of burlap back in the summer with intentions of getting a head start on my fall decorating, but that didn't happen. I have seen so many beautiful burlap wreaths on Pinterest, and I wanted to add one to my fall decor. 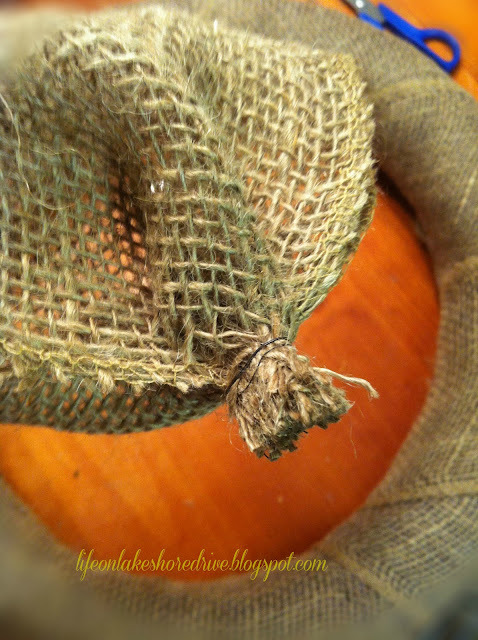 Here is the roll of burlap that I purchased at Michael's. I planned to use a metal wreath frame, but wasn't loving the way the burlap looked on it. I still had 2 pool noodles that I had also purchased during the summer. So I decided to use that. I taped the noodle together and wrapped it with brown tissue paper, because I didn't want the blue to show through. The next step was wrap with burlap. After wrapping with burlap, it was smaller than I wanted it. I decided to go with a puffy wreath to make it larger. I cut strips of burlap about about the width of the inside of the wreath.
. Next, I folded the ends together and wrapped with floral wire. The photo below is kind of scary looking, but I wanted to make sure I had my burlap flowers evenly placed around the wreath. Sorry the photos were taken inside, but I had to finish this last night. Once I had the burlap "flowers" placed on the way I liked them, I filled in the outside edges with burlap. The photo below shows the outside filled in. 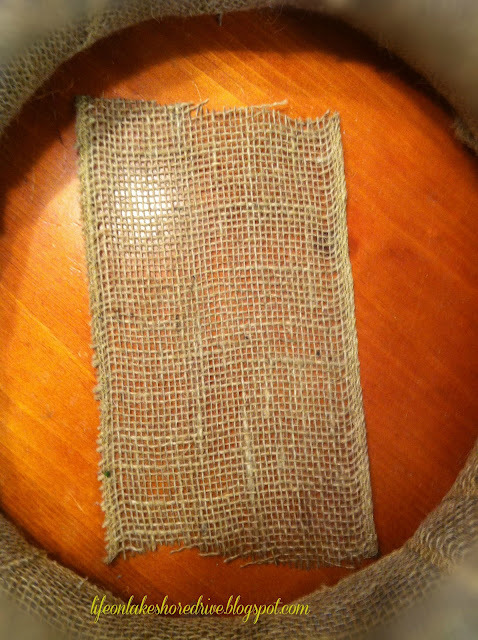 I also took a few straight pins and pinned down the rough edges of the burlap to give it a smoother look. Here's a quick little tip.....if you are trying to decide if you want to use rosettes or flowers, toilet tissue makes super fast, beautiful rosettes! :) I quickly made these and stuck them on the wreath to see if I wanted to use rosettes. I do love the white flowers with the burlap, so when spring rolls around all I have to do is change the flowers. Well, make real fabric rosettes that is! Here is the wreath after I decided to use fall flowers instead of rosettes. This morning I took this photo, but decided it still needed some color. Here is the finished wreath. I weaved some dark red ribbon through the wreath and stuck a few pieces of fall ribbon in the wreath. I also moved my berry spray to the top. 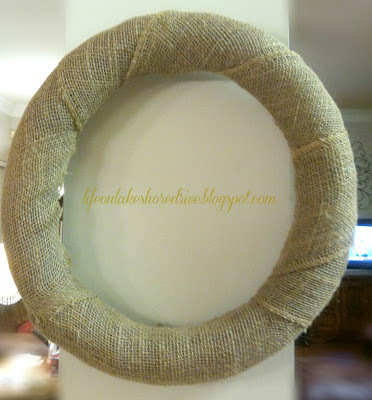 This was a super easy wreath to make, but this burlap is sure rough on the fingers. It would be better to spread it over a few days instead of one night. I just pinned my flowers on the wreath, so it can be changed seasonally. I thank you so much for stopping by for a visit. I always love hearing from you! Happy Fall, y'all!! So beautiful! I love wreaths, but fall wreaths are the best! Great tutorial and pictures. Thanks for sharing them with us! I love it!..definitely like the idea of the floral wire working double duty as the wire to secure the burlap to the wreath form! Beautiful, I love wreaths and love to make them too, I have a few different wreaths on my blog. This is really beautiful!Thanks for sharing tutorial. I am in love with this wreath! I just might have to make one similar (I have some of the exact same burlap ribbon in this color, red, and olive...I wonder what a mixture of the three would look like?...too much? I LOVED YOURS!! Thanks for sharing! Looks really pretty Kathy. No fraying burlap is what I like. May just try to make that one. This is an excellent tutorial. I can do this! Super cute! I love how you folded the ends together to make loops for the flowers. This is very versatile for different seasons. And I didn't know about making TP rosettes. Great idea! Thanks! It's very cute, and indicative of Fall weather. I love the colors. 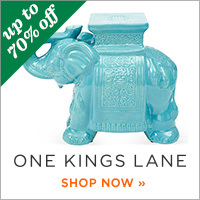 What a gorgeous piece! It looks so pretty. Have a great week. Thank you so much for visiting. Thank you. Can't wait to check out your wreaths. They are so fun to make. Thank you! I am so ready for the fall temperatures! :) Thanks for stopping by. It turned out gorgeous!! I love the end result with all the colors :) Thanks for sharing with my NO RULES Weekend Blog Party! This came out great!! Its beautiful!! TFS! Stopping by from Bowdabra's Blog linky party and your newest follower. I lOVE LOVE LOVE this wreath! Thanks for sharing the idea! 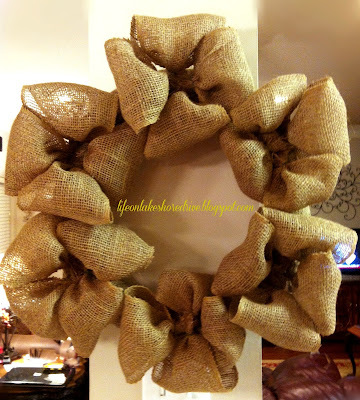 I love this wreath, love that you used burlap and wrapped ribbon throughout. I've also pinned it, really just what I was looking for and I just bought 2 paks of the burlap last week when it was on sale at HL. Now I know what to do with it. Thanks for sharing your creative inspiration with Sunday’s Best – you helped make the party a success. PS - following you on Facebook! Gorgeous wreath! 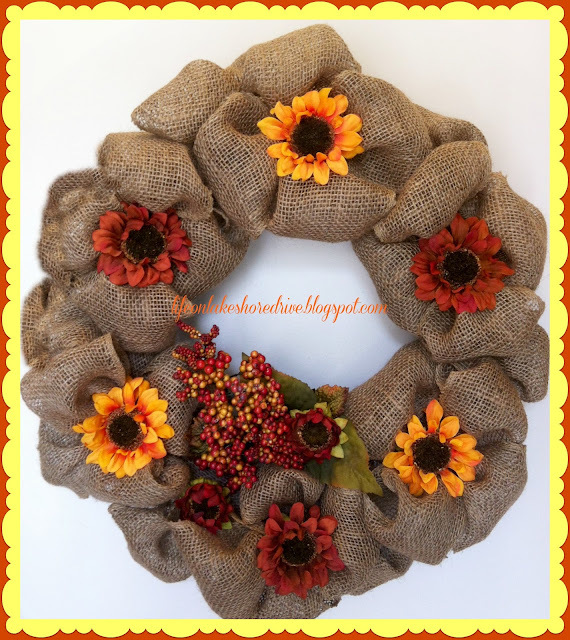 Burlap just goes perfectly with fall! I would love for you to come link up your awesome blog to my Get Social Sunday party! what great colors in this wreath! love it! Thanks for visiting me and commenting about my book covers. I think the addition of the ribbon really ties the whole wreath together. Also love the color of the flowers. It really looks like fall! I love your wreath! I'm off to pin this to my Fall board! That is so cute Kathy! I love it, great tut too. Thanks for sharing at my party. Kathy, I love this!! 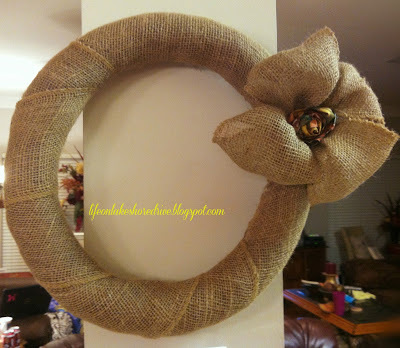 I've been looking for a way to make a burlap wreath for my old chippy door, and this one is perfect! Oh Kathy it's beautiful! Thanks for sharing at tip toe... I just love the way the burlap adds that rustic charm to your decor! Beautiful job. 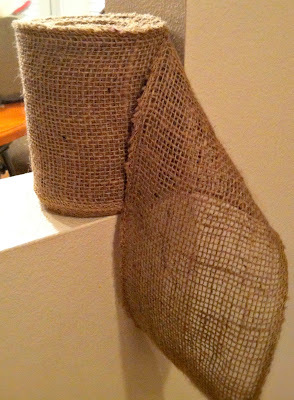 I think burlap adds the greatest texture to projects! Thanks so much for linking up at One Creative Weekend! Enjoy your week. 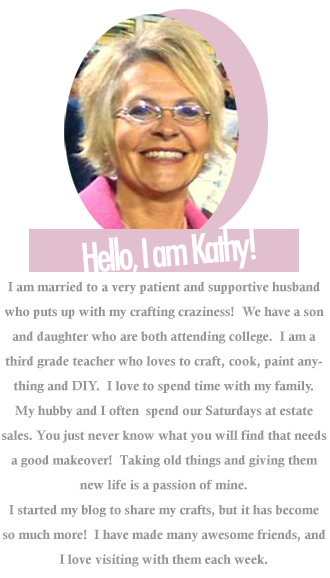 Kathy, we love this! 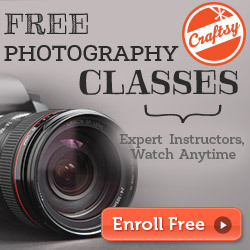 Thanks for linking it up to the Crafty Showcase. We are featuring you on our Facebook page! Woot! Have a great day and stop back in on Saturday-Thur to link up more of your crafty ideas! Hi! I'd like to invite you to join our Halloween Link Drive! Way cute, I love the giant flowers! Thanks for sharing at The Fun In Functional! Hi! 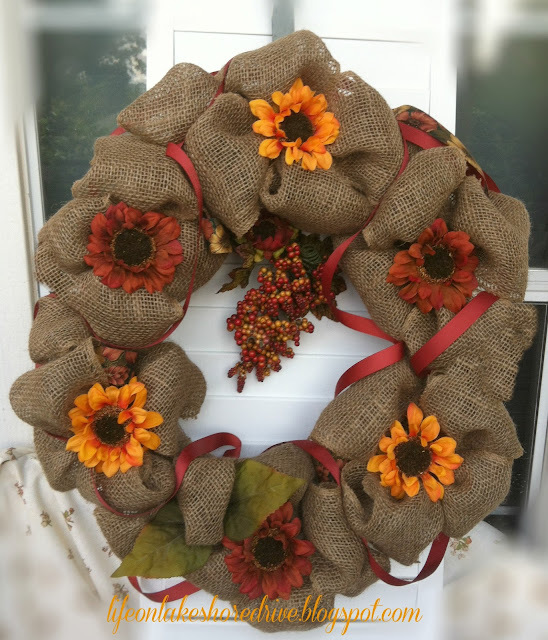 Love this burlap wreath, and how each flower has it's own nich in a burlap flower. Your newest follower with GFC and Linky. I just love your wreath! It's just amazing how burlap can be used to look so gorgeous. The red ribbon was the perfect finishing touch. How beautiful and clever! You give great instructions. I can use those. Thanks for sharing on Thursday's Favorite Things. Oh so pretty! I love how you weaved the ribbon thru the burlap...such a great touch! Thanks for sharing this with us at the All Star Block Party. I made a very similar one out of the burlap ribbon and a wire wreath. I only placed one Fall floral pick on mine. Yours looks gorgeous!! Pretty wreath. It looks so simple to make. I'm gonna have to try your tutorial. Thanks for sharing. Hey Kathy! Just wanted you to know that we are featuring you tonight at Keep Calm & Link Up! Stop by sometime this weekend to link up again and grab a featured button! What a pretty wreath! I didn't even know you could buy burlap in a roll. What does that say about me... I love when the burlap puffs up like flowers. It's so beautiful. Thanks for sharing on Confetti Diaries this week! 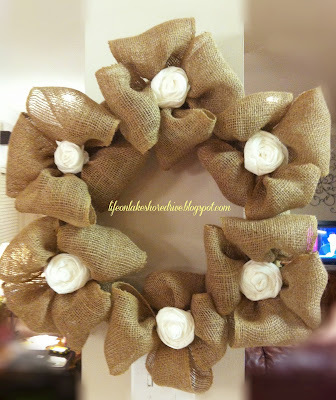 Ah I love the burlap Wreath! I am currently working on a fall wreath. I may just incorporate some of your ideas into its design :) Thanks for sharing it! I want to try and make this. Looks pretty simple. I think I will struggle with making the flowers around the wreath. Can't wait to try. Newest follower! Hope you can stop by. If interested please enter my giveaway for a Flower Ring/Watch. We will give you a Facebook, Twitter and Pinterest shout out today! Have a great weekend and we can't wait to see what you share with us in the new Saturday Showcase! I LOVE this! I was wanting to "update" my floral wreath to make it more "country". I can't wait to go get some burlap! Can't wait to see yours. Have a great weekend. Thank you so much! It really was easy to make. :) I can't wait to see yours. Thank you so much for following. I am so happy to have you follow. I am headed to check out your giveaway now! It's lovely!!! 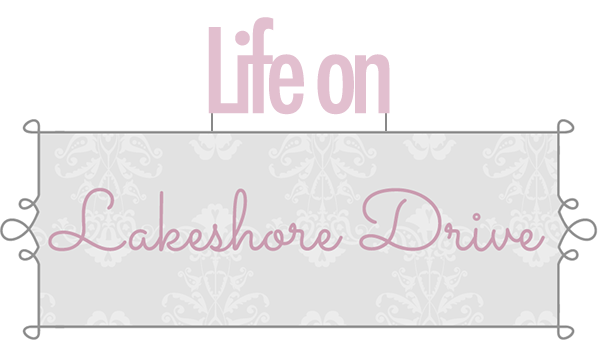 !Thank you for sharing at the Thursday Favorite Things blog hop . BIG hugs!!! Kathy this is so pretty! You did a fabulous job! Thanks for sharing this with us! What a beautiful fall wreath! I am so glad you shared a tutorial because I wouldn't have known how to do the flowers around it. Thanks for sharing your talents with us at Gettin' Krafty! That is adorable! I am really behind in decorating for fall, but you've inspired me to start digging things out of the closet. Hi sweet Kathy! Well, of course you know that I LOVED this wreath from last week!! Thanks so much for linking up at my first ever linky party! 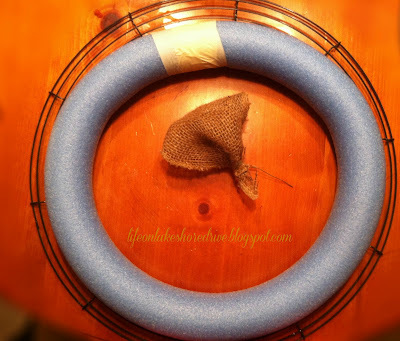 I featured your wreath on my blog for Creatively Tuesday! Go get your button!! Hugs!! Darling wreath! Thank you for sharing this wonderful idea at our linky party at http://www.finecraftguild.com/ & we love seeing you back there this week with another project!! Pool noodles! Go figure! Love it! Very, very creative! I will be featuring your post in my upcoming Home and Garden Thursday - I do appreciate you sharing! Hi Kathy I love your wreath I have a question, when you finish doing the burlap flowers you hot glue them to the wreath? Very cute! Thanks for linking up! Love it! 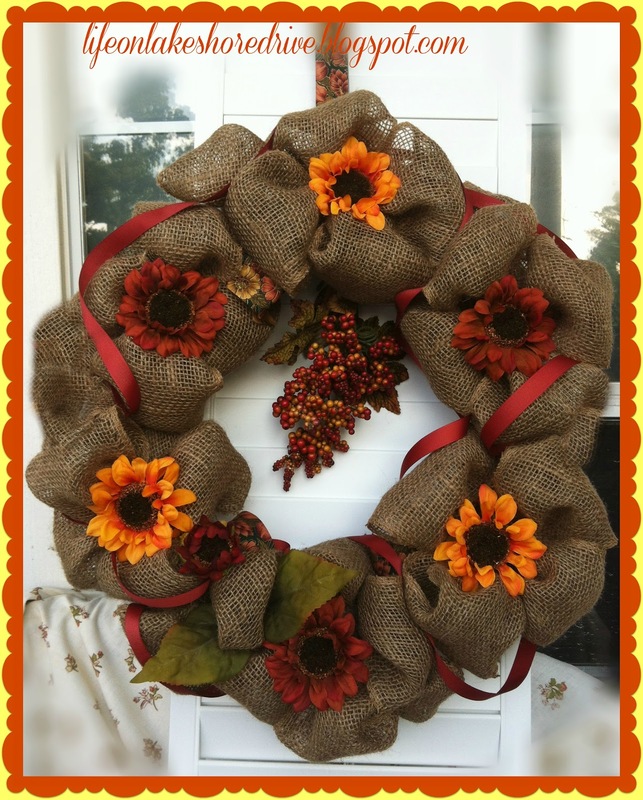 Hi Kathy -- thanks so much for sharing this fabulous crafty fall wreath over at Craft Junkie Too. 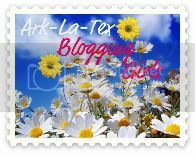 It's part of our Featured Favorites for this week's link party...so I hope you can stop by and maybe grab the featured me button for your blog. Kathy you really know how to but out the greatest projects. You are so talented love this wreath! Thank you so much for linking up. Hope you have a great weekend. SEU TRABALHO É MARAVILHOSO MEUS PARABÉNS....VEJA TAMBÉM MEUS TRABALHOS NO FACEBOOK...DEUS A ABENÇOE. http://www.facebook.com/mariajosesimplicio.silva conheça também o meu trabalho. Guess what, Kathy? We are still loving this project! You are in our Top 12 Feature Friday Post from 2012. We loved it so much that you are one of the top 12 featured blog projects submitted into our Feature Friday Linky. I just found your blog and I love this wreath! You have so many great projects! I would love you to stop by my blog on Tuesday. I am starting a link up for awesome projects like yours in the hope that more people can discover the projects we've all made and love. The link up is especially for older projects that we feel didn't get enough attention. This adorable! You have such neat posts on your blog. New follower from the blog hop! 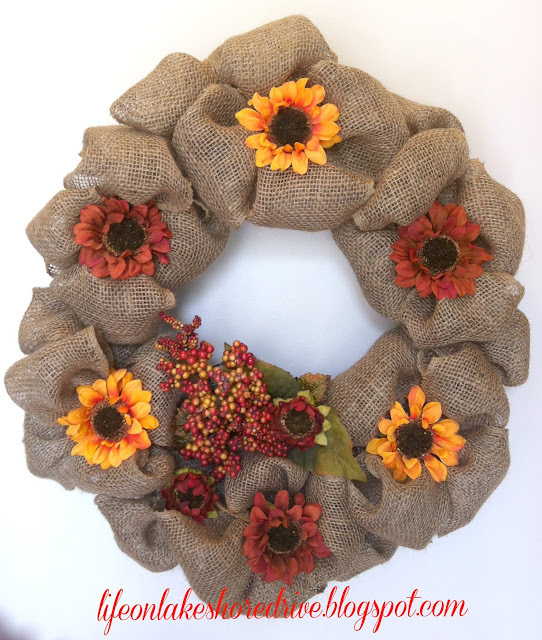 Love your wreath, especially those lovely burlap flowers! The lovely fall colors look so pretty!